Consumerism, culture, catastrophe and carnival. Just a few of the words that spring to mind when I reflect on our experience of Liverpool so far. We have one more day tomorrow to absorb a little more of this amazing complex city which, like our journey here, seems to be divided into so many conflicting elements. After several days of peaceful rural surroundings we knew things would be very different as we approached the big city but the contrasts of the final few miles was quite staggering. The first part of the journey gets progressively more depressing as you leave the countryside behind to pass through increasingly downtrodden areas. Dead factories line the canals decorated by garish graffiti and long ago broken windows. All manner of garbage floats on the water while determined swans and coots sit unconcerned on their nests, hell bent on bringing new life into a cesspool of filth. 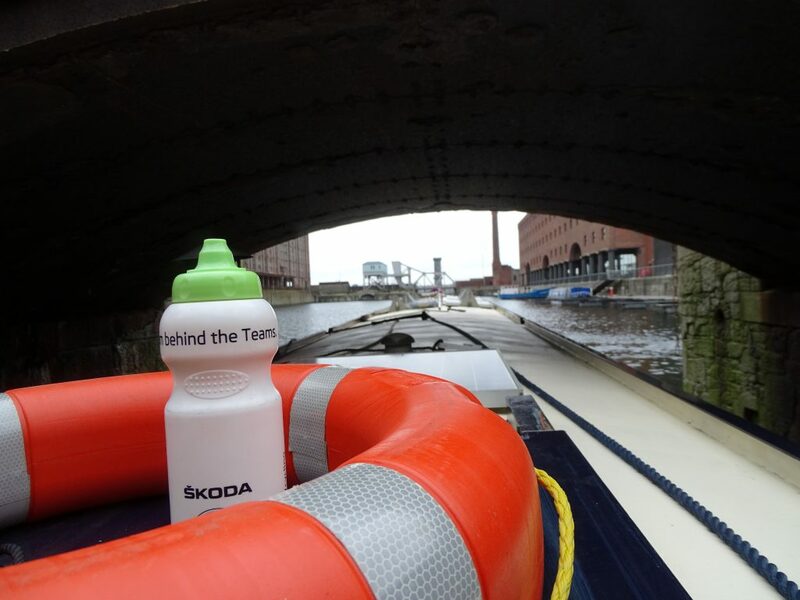 We are constantly on the lookout for anything that might get wrapped around our propeller having been warned by so many boaters of the dangers of bikes, mattresses and even tents discarded in the water. It’s a relief to arrive at the top of the Stanley Locks and know that we will soon be out of this depressing section of the journey. 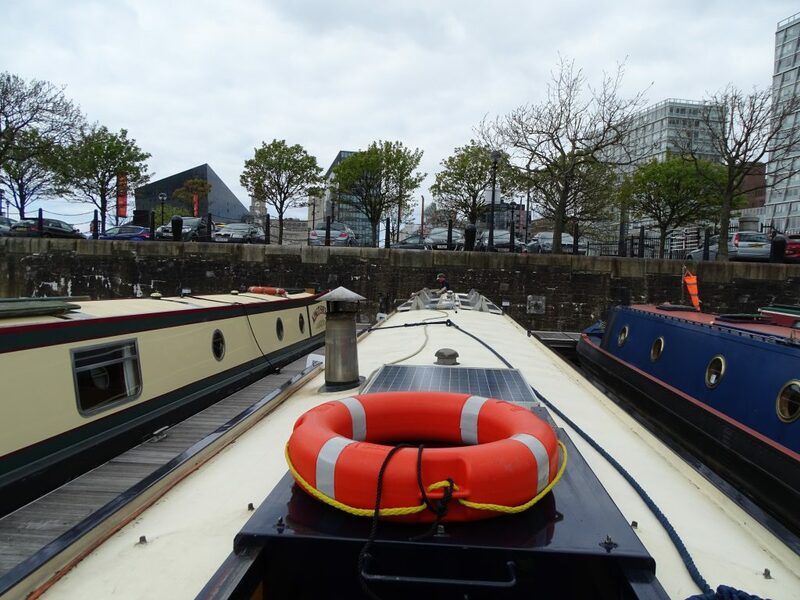 We are joined by another narrow boat, Penny Less for the descent of the locks and Alison from the Canal and River Trust along with a volunteer are waiting to assist us with the passage into Liverpool. I’m a little apprehensive having watched a couple of videos of the trip. It will be our first experience of deep open water and we nervously don our life jackets in readiness. We share the locks with the other boat and Gill gets some more practice handling the boat. 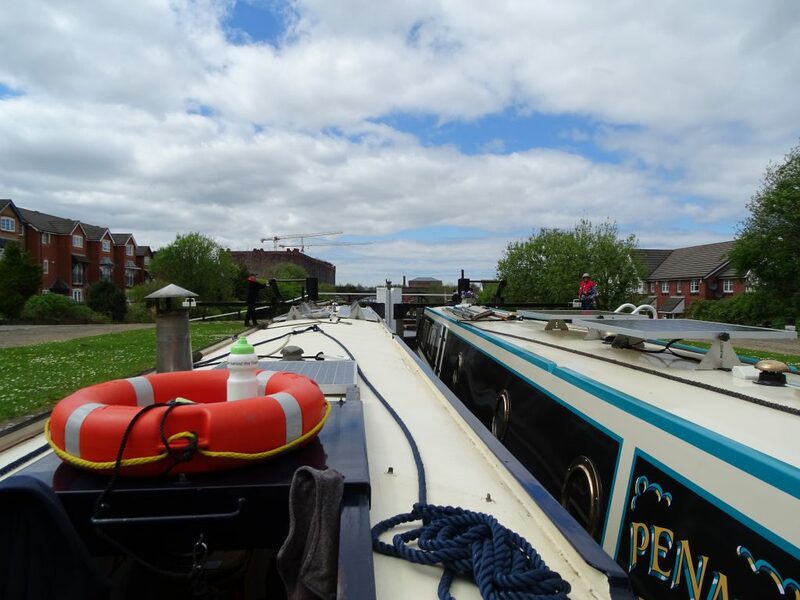 With many hands to make light of the work it seems like no time at all before we are deep in the final lock, waiting for the heavy wooden gates to open and give us passage into our first open dock. Our new friends on Penny Less agree to go first as they are more experienced and we emerge into a whole new world. The expanse of water looks huge and is surrounded by high, cliff like warehouse walls which we pass beneath in our tiny craft. 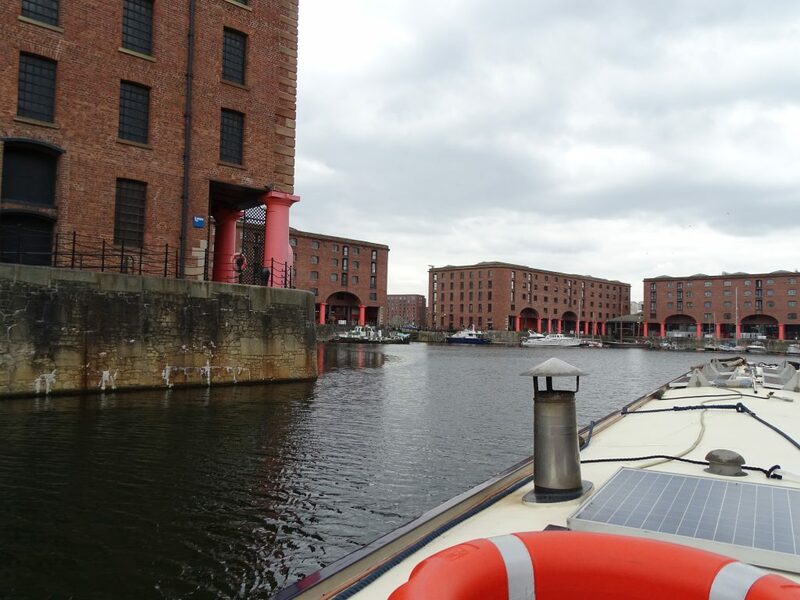 Turning left between massive stonework we enter Sid’s ditch, a long narrow passage between a dock wall and raised embankment which separates us from the river Mersey. I’m struggling to keep up with the other boat as our engine complains at these new demands. 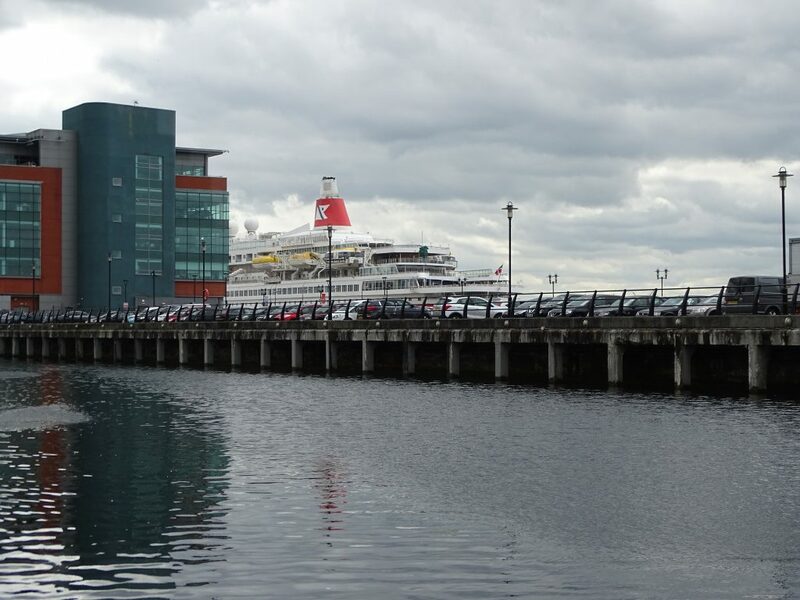 As we cross more open docks we get our first glimpse of famous landmarks. 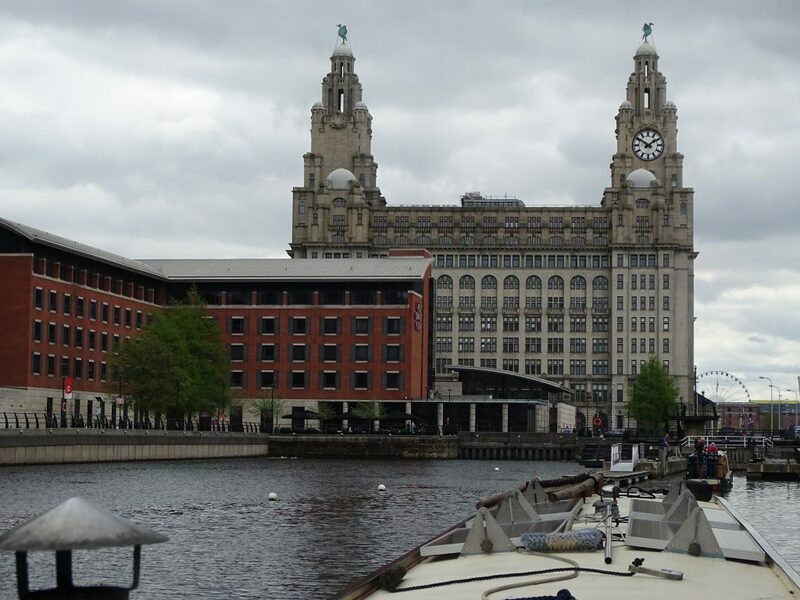 The Liver Building with it’s famous Liver birds appears in the distance and I struggle to concentrate on following the guiding buoys and the rapidly receding stern of Penny Less whilst wanting to drink in every aspect of the iconic dockland landscape. 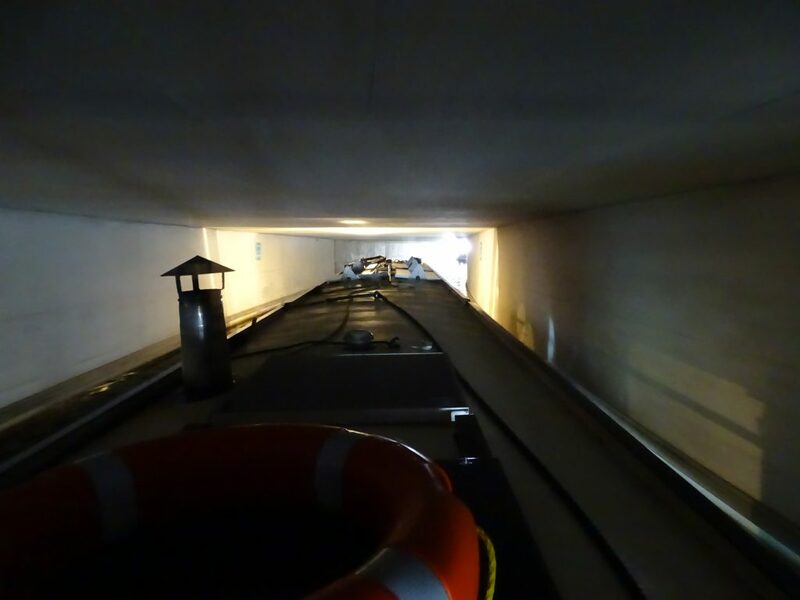 We enter Princes dock and after passing through another lock the first, and longest, of three tunnels. Entering the tunnel everything looks black despite our headlight but my eyes quickly adjust and it’s easy to follow the twists and turns to emerge into blinding sunlight once more. 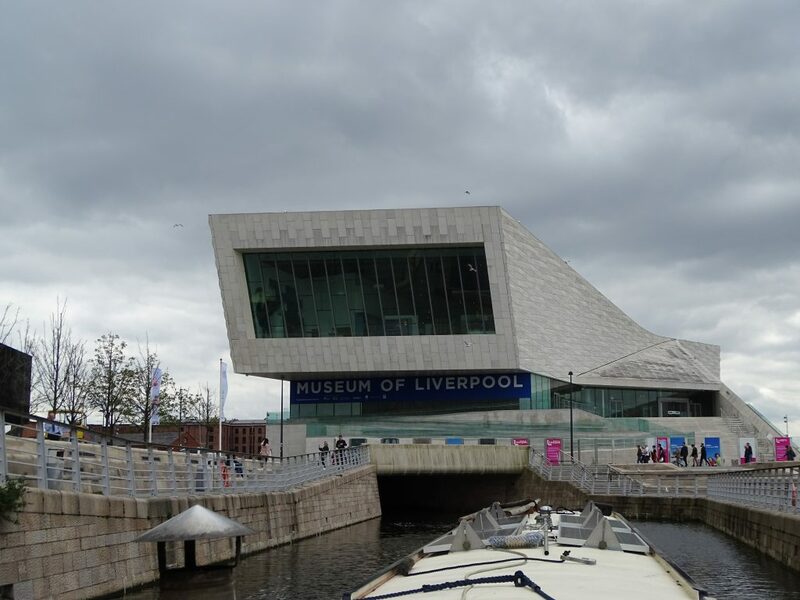 More bridges, famous buildings, a cruise ship on our right and then suddenly the huge angular facade of the Museum of Liverpool is directly above us. Tourists on bridges wave and call to us. It’s hard to hear what they say over the sound of the engine but I do hear “Welcome to Liverpool” which makes the impossibly wide grin on my face even wider. 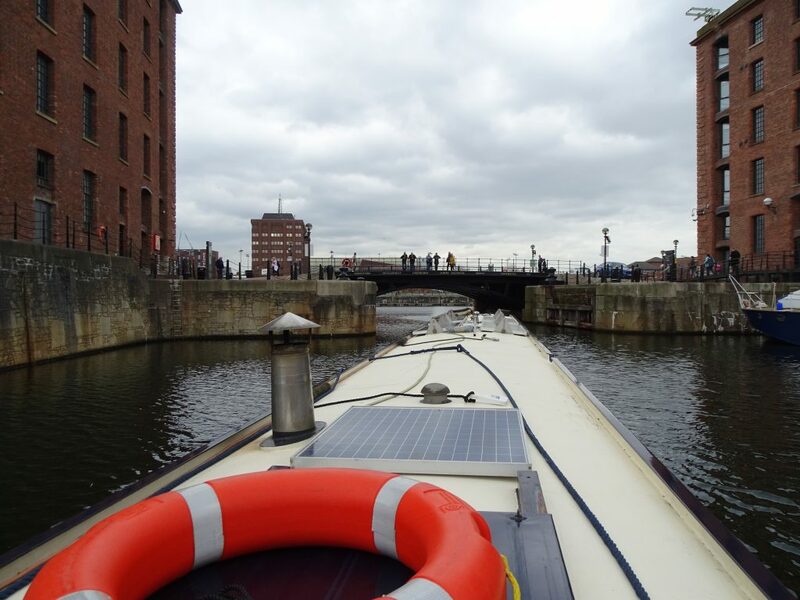 One more lock and we are making the tight turns now through Canning dock under yet another bridge into the famous Albert dock. 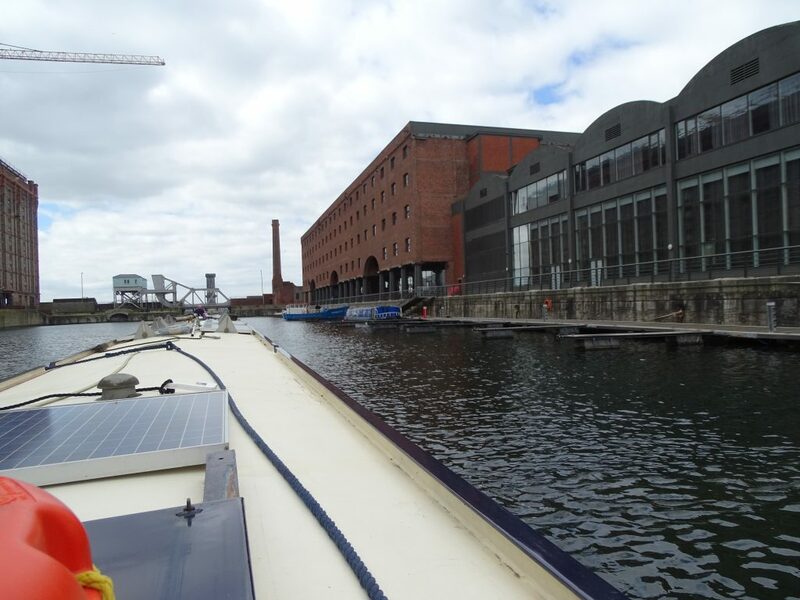 Finally we enter our allocated place in the Salthouse dock without embarrassing ourselves too much and tie up on jetty S3. All of a sudden the sun comes out and it’s hot. Friends appear from another boat to greet us, the kettle is on and we are sitting on the deck talking excitedly about the adventure. 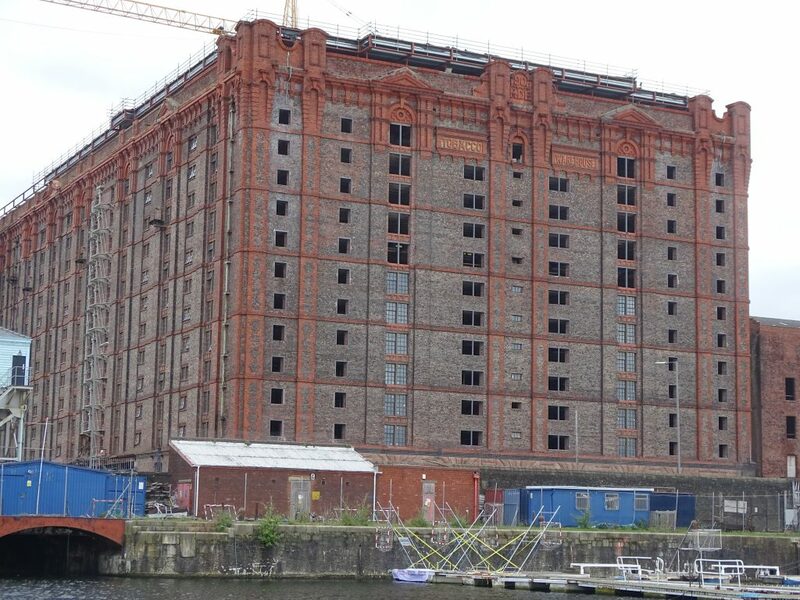 Just trying to take in how surreal it is to be right in the heart of the Liverpool docks and to have arrived here on a narrow boat is difficult. Tea is followed by beer and finally it begins to sink in that we have arrived. There is only one word for the experience and our situation and it’s another ‘C’ word. It’s just plain crazy. On our first full day the hot sunny weather brought the crowds out and as we walked through the bus station with visiting friends I witnessed a perfect example of the diversity of this famous port. Several buses were delivering their passengers for a day out; about seventy percent turned right into the Liverpool One retail extravaganza while the remainder turned left for the docks, museums and art galleries. A young couple strolled arm in arm in the bright sunlight looking as if they were heading for a glamorous photo shoot. He was handsome and tanned. Many hours of hard sweat in the gym had earned him an enviable muscle bound physique which threatened to burst out of his fashionable designer shirt. His partner was slim and beautiful with perfect hair and make-up and his strong arm supported her as she teetered on her needle like heels over the rough cobbled paving. Expensive perfume and after shave followed them in the breeze. They changed direction to avoid what appeared to be a pile of rags and rubbish. A couple of grubby looking sleeping bags, old newspapers and assorted debris piled against some railings. They didn’t notice the movement, as the homeless man, about the same age as them, raised his unshaven, ragged haired head from within the smelly heap. They showed no recognition as he lit his roll-up, took a deep satisfying drag, coughed, spat and reached for the half empty bottle of Lambrini to ease the pain of his miserable situation. This place, I thought, is definitely a place with many faces. Somewhere that is crying out to be scratched well beneath the surface. After four days we are exhausted and I am reeling from the onslaught of contrasting emotions, information and images. Cultured or crude, rich or poor, modern or ancient; Liverpool has got it all in buckets and I love it.